If you search your ancestors in Bisceglie, Puglia, info about your Italian family are stored in the City Office archives or at the parishes. In towns and villages of Puglia and in Barletta-Andria-Trani province registry offices were established in early 1800: it means that you could find information in Bisceglie registrar as of that date. So, if your ancestors were in Bisceglie in the nineteenth or twentieth century, then you could try to contact the City Office of Bisceglie to know more. Before to start your genealogy research in Bisceglie, we suggest you to read our tips for your search . They are useful to search in Puglia and in Bisceglie too. 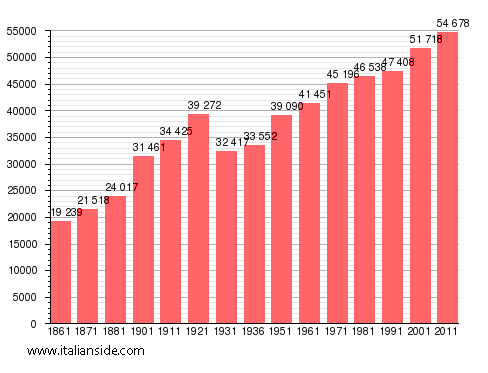 In the next picture you can see the demographic trends in Bisceglie from the Italian Unification (1861). It could be important to know if the last name you are investigating is a frequent surname in Bisceglie. As more your surname is common in Bisceglie, as more it could be difficult to find the right info about your ancestors in Bisceglie archives if you have not exact dates. 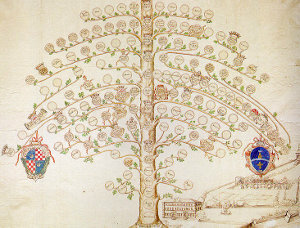 Acquaviva, Amoruso, Bruno, Cafagna, Cannone, Caputo, Carbone, Curci, Damato, Dell’Olio, Di Bari, Di Benedetto, Di Leo, Di Palma, Doronzo, Filannino, Fiore, Fiorella, Ieva, Lanotte, Lattanzio, Leone, Leonetti, Liso, Loconte, Lomuscio, Lorusso, Losito, Matera, Monterisi, Papagni, Pastore, Patruno, Piazzolla, Piccolo, Pistillo, Porro, Ricchiuti, Ricco, Rizzi, Russo, Sgaramella, Simone, Sinisi, Todisco, Valente, Zagaria, Zingaro. Church archives in Barletta-Andria-Trani province may instead contain even older information, but they are far less accessible from abroad (and almost impossible by email). If you have the opportunity to visit Bisceglie and Barletta-Andria-Trani province, you could plan to investigate churches’ archives by yourself (or with us! ), but from abroad is very difficult to obtain any result unless you find a reliable local help. If your research is in a dead end and you need professional help from our local Italian genealogists write to bisceglie@italianside.com our expert in Bisceglie area will study your request and will reply to you with a research plan and a quote. Hello, I’m looking for more information on my great grandfather Natale leonardo Monopoli, he was born to Angela Cocola and Pietro Monopoli around 1906 in Bari, Bisceglie Puglia, Italy. His mother passed away soon after and he and his father arrived in NY in 1911. I’d like to plan a trip to Italy, but first I’m trying to do a little more research about our family tree. Does anyone know any other Monopoli’s or Cocolas? I am looking for family members from Bisceglie with the names DiReda and DiTerlizzi. The DiRedas came to the US between 1905-1907 and DiTerlizzi around 1915-17. Both families settled in Brooklyn NY, although some of the DiTerlizzi’s may have also settled in Massachusetts and Canada. Thanks for any help. The city you are looking for is Redwood City. It is near San Francisco, about 30 miles away. There is Frank Paolina listed in San Francisco in the 1920 census with a family, wife is Marie. Could that be him? I am looking for DeCillis marriage records from 1915-1918 for Sergio DeCillis and Angelina, I do not know the marriage date, but they had one son, Sergio in 1919. Would you be able to help me find Angelina’s maiden name? Hi Valerio, my name is Stephen Gallo and my grandparents were born in Bisceglie. My grandfathers name was Domenico Gallo and was born circa 1895 to 1900. My great grandfathers name was Carmine Gallo and was a tailor. His wife’s name (my great grandmother) was Ippolita Monterisi. I am trying to find out if there are living relatives still living in Bisceglie. My grandfathers sisters name was Titina and she married Antonio DeCillis. One of their sons, Mauro DeCillis, was in the Navy in the 1950’s. I believe they may have lived in Trani. Thank you so much for any help or advice that you can give me. Hello, my great grandparents were from Bisceglie. My grandmother is the youngest of 7 children, 1 deceased as an infant. 3 were born there,2 in Worcester,Ma., grandma in Fresno ca. Wanted to know more about my ancestry. Hello, I am looking for the DeCillis family. Sergio and his wife, Angelina emigrated to the US (New York)via Naples in 1920. We are certain of one son, Sergio, born in 1919. Are there any other children? Does Sergio Sr have any siblings? He was born in 1891 in Bisceglie, Bari. Hello Mr Defendis, My grandfather also came to Fresno around 1912 from Bisceglie, with his wife and 4 sons. They started a garbage company and had landfills in the Kerman area. In the late 50’s they opened a restaurant on Belmont and 9th Esta d’ villa. I am sure they crossed paths. If you would like to start a research in Bisceglie please send your request to bisceglie@italianside.com.